Full disclosure: Professor Ryn and I have known each other for more than thirty years and spent considerable time together, socially and professionally. In 2007, we cofounded the Academy of Philosophy and Letters , aiming to fill the Philadelphia Society’s former role as a forum for conservative discussion, before it fell under neoconservative control. But we came to a parting of the ways when Professor Ryn and an assistant, NHI President Joe Baldacchino, demanded the removal from our organization of anyone who had addressed the IQ question or even been present at conferences in which this delicate subject was broached. My admission that I did indeed believe that individuals and ethnic groups have differing cognitive abilities resulted in Ryn’s unexpected insistence that I myself should leave. I took along those who opposed the censorship and set up the H.L. Mencken Club. From what I can determine, our side has many more members than APL—and more open discussion. (HLMC has its sixth annual conference in Baltimore November 1-3—register here!). Nevertheless, there is nothing in the current Humanitas or Ryn’s online piece that I would disagree with—for a very simple reason. 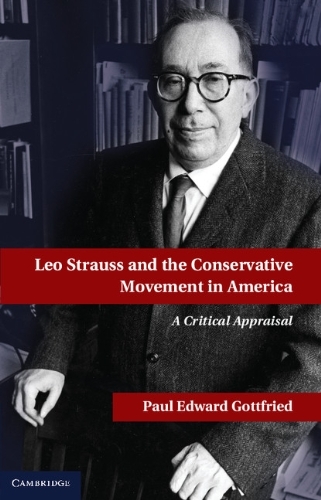 Both restate the thrust of my most recent book Leo Strauss and the Conservative Movement in America . The arguments marshaled by Ryn indicate, as does my book, why Straussians reign in the NYT’s Sunday Book Review Section as well as in Conservatism, Inc. Although Ryn does not make this last point explicitly, perhaps for fear of reprisal, a fuller explanation is at least implicit in what he does tell us. His comments may also explain why my book, initially marketed by Cambridge with high hopes and considerable promo, received absolutely no attention in the national Main Stream Media. According to Ryn, the Straussian persuasion assumes a spirit of alienation on the part of those who promote it. Ryn sees an illustration of this in Strauss disciple Bloom’s best-seller The Closing of the American Mind . Bloom and other Straussians have a tendency to read their own preferred view of the America’s founding principles, as understood by themselves and their mentor, into long dead authors. Ryn correctly notes that Bloom, in a widely distributed commentary on Plato’s Republic , informs the reader that Plato was defending democracy in his most famous dialogue. Strauss makes a similar statement, writing about the Athenian aristocratic historian Thucydides that his subject was actually vindicating democracy, despite Thucydides’ bitter contempt for the way Athenian democracy functioned during the Peloponnesian War against Sparta. The conventional view is that Strauss and his disciples worked mightily to renew interest in the “ancients” as an alternative to modern political conceptions. This may not be the case, however. Straussians were really interested in enlisting ancient and early modern European political writers for their own crusade for American democracy—and that in a very contemporary form. Ryn also observes that Catholic intellectuals gravitate toward Straussian teachings, a fact that I dwell on in my book with greater thoroughness. It is clear that real Straussians, as opposed to Catholic wannabe Straussians, are blatantly contemptuous of revealed religion, particularly Christianity, and work persistently to wash out any religiosity from those political philosophers they profess to admire. By the time these plastic surgeons finish with Plato, or any other thinker whom they claim to be able to interpret with an unmediated view of the past (Straussians do not recognize historical distance), they’ve turned their subjects into far different beings from what they likely were. As I quip in my book, Straussian subjects—including the ancient Greeks–are usually made to look like Jewish agnostics living in New York or Chicago and attending synagogue services once a year. But the Catholic goyim love the Straussians because they yap on about “morals” and “civic virtue.” They even occasionally, while blatantly ignoring the facts, try to identify Strauss and his disciples with medieval scholastic thought. Even more importantly, says Ryn, Catholics recognize in Straussians figures who share their own “alienation” about living in a predominantly Protestant country. As Canadian philosophy professor Grant Havers documents in a forthcoming book about the studied avoidance by Straussian interpreters of America’s Protestant heritage, Straussians provide a narrative about the American founding that make ethnic Catholics feel secure about their Americanness. According to the Straussians, America was founded on secular, materialist and democratic principles, but in no way on Protestant ones. Thus, if the Straussians try to de-Christianize and de-ethnicize America, they also conveniently cover up the Protestant aspects of a specifically American tradition. Catholic Straussians (of whom there are many in Conservatism, Inc.) feel safe living in a “propositional nation” and “global democracy” in which they don’t feel threatened by the real American Protestant(and/or Northern European) American past, extending back to the colonial period. It’s more convenient to jettison such associations for the vision of a constantly changing hybrid society that is held together by universal, egalitarian propositions. Ryn is quite good on these points . But (alas) he falls down on the job when it comes to naming the most obvious recruits to the Straussian persuasion. He hints at identifying them, but may have recoiled from the implications of being extremely candid. As a Jew, I shall do it for him. But, having made that clear, I don’t think I’m simply reacting to being further marginalized by a predominantly Jewish intellectual Establishment and its obliging gentile drones. And there is another side to my perplexity. Although I can understand the existential reasons that Jewish and more than a few Catholic Straussians read texts as they do, it is hard for me to believe that any serious person could take these readings for high scholarship. As a strategy, perhaps! Or even an attempt to deal with psychological and social alienation! But as a definitive reading of what some long-dead thinker really meant? Paul Gottfried [ email him ] recently retired as Professor of Humanities at Elizabethtown College, PA. He is the author of Multiculturalism and the Politics of Guilt and The Strange Death of Marxism His most recent book is Leo Strauss and the Conservative Movement in America. 13 Comments to "Claes Ryn, Allan Bloom, Leo Strauss, and Me"
A notorious Austrian anti-semite at the turn of the 20th century and a member of the Catholic Social Party of Karl Lueger, the mayor of Vienna (I think his name was something like Bialoslawik, like many Viennese he had a Slavic name; Kurt Waldheim’s real name was Wlaclawik) once exclaimed that: “Scholarship was what one Jew stole from another!” This could be a way of understanding Straussians. Mr. Gottfried should not have been surprised at his work being whited out so to speak. He trod on a very verboten subject and exposed people and their agendas that weren’t meant to be exposed. Many don’t fare well and end up ostracized in such situations. The thing is, is that the Straussians sit at the heart of mainstream of political and religious Conservatism today. They don’t want to be exposed as a bunch of Machiavellian schemers, liars and flim flam men hijacking the movement for their own ends. But nevertheless they are a poisonous element in conservative circles that needs to be exposed given the damage they have done to the country and it’s standing in the world. I should add that the Left after the Iraqi invasion and the discovery of the Neo-Con agenda did a lot of research to expose Strauss and Bloom and the associated dual passport holders that run most of Conservative Inc, warning people that they were not be trusted. Sadly, non-Jew Conservatives ignored their discoveries for various reasons. Who has published research on actions by European Jews that pissed off their neighbors leading up to WWII? Would such a topic be off-limits? Is the universal unpopularity of Gottfried’s writing, his ostracism from the groups and circles of friends whose affection he publicly yearns for in his craven, lonely decrepitude, and his spiraling down the rabbit hole of racism an indication of a well executed plot by his imagined “Conservative, Inc.” (aka Ashkenazi Jewish Conspiracy) or merely of his own mental illness that was obvious to many thirty years ago and to all but his deranged HBD pals today? A candid appeal to reason reveals the obvious truth. If the professor had a sane friend or loved one, it is hoped that he would seek professional medical help for the aged scholar before what little remains of his once promising reputation is flushed down the memory hole forever. In other words, you can’t refute Gottfried’s claims about Catholic resentment of Protestant America. Are all “anti-Semites” notorious?Are there any non-notorious ones? Straussians do seem to be using rhetoric to fool the masses. Straussians do seem to be preventing the government from realising just how clever the Straussians are and what they are about. Going by what they do rather than their explicit statements, Straussians seem to have taken a lot from Plato’s thought. Thank you Paul Gottfried for your eloquent and well-founded article. While I will not be buying your book, as I am attempting to budget (conservative principles in action), I will put it on my list for when I do have discretionary income. Your ideas on how to be a conservative in today’s world, where conservative ideas have been so tarnished by their imposters, give hope to a young conservative man. I grew up naturally conservative as a smart nerd in school – I was instinctually repulsed by modern pop “music”, by the marijuana and booze parties in high school, by the the disingenous efforts to explain away the poor achievement of inner city Blacks on false causes – and most of all, by the lack of attention to detail and structure in how people read texts and proposed ideas. I like how in your analysis, you go straight to the cause – people learning how to read texts based on their emotional or existential crisis, and not in relation to what is actually said in the text, in the context of when it was said. I was a victim of this way of “reading” for some years in college, which I think led me astray from some of my earlier principles I instinctually had growing up. It’s almost as if teaching a way of reading a book will teach a certain way of “reading” reality as well, and reacting to this situation in a similar way to one’s reactions to reading. Your work to discredit the Neo-“Conservatives” is very valuable. It will be of service when it is time to restructure America (or what we can of it) based on true conservative principles. Included in this, is a genuine respect for social welfare as well. I am currently seeking to criticize both neo-liberals and neo-conservatives with respect to what their policies do to the “working class”. One could almost summon a neo-“Marxist”, anti-“Racist” critique of both Neo-conservative and neo-liberal ideologies. The connections to the ruling elite of the ideologies, and the way in which they are serving to enrich the elite at the expense of the poor can be potent ways to bring these ideas down. This would just be a counter-poison, not an actually complete theoretical system – I don’t believe in “Marxism”, except — to the extent that thinkers who do not serve the ruling elite are ALWAYS marginalized, so that truly oppositional thinking is made difficult by brainswashing. Coupled with a respect for hierarchy, natural genetic diversity of mankind, and a well-defended free-market, America may in about 40 years be in a state of regeneration. First we need to take down the fake capitalists and the false conservatives. Thanks for the article, Paul, and for all the embedded links as well. You should ignore the ankle-biters in the comment thread. They’ve got their orders. They have their job to do. I expect they are going after you with particular vehemence because (to them) you are a Jewish race traitor. To me and many others you are an American patriot. As conflicted as they are about their loyalties, I just wish they’d do the right thing and make aliyah. I’ve always interpreted Neoconservatism as being = (Western Conservatism-Christian God). The problem that I see with Western Conservatism, from a Jewish perspective, is how to square its Christ-centric nature with Judaic religious identity. The two appear to be mutually incompatible. The only workaround to this problem is to strip the religious component of Conservatism and redefine it along secular lines, thereby avoiding the problem. Hence, Neoconservatism. Essentially, the Jewish scholars want a type of Conservatism in which they can comfortably “fit in”. The problem with this type of Conservatism is that it is not Conservative at all and tends to be stripped of the “values” that gave Western Conservatism it’s distinctive character. The resultant Conservatism (stripped of its imperatives) becomes managerial in nature and situational with regard to ethics, and it morphs into crytpo-liberalism, albeit with Conservative dressing, under simple cultural pressure by absorbing liberal cultural values. Everyone needs an imperative. The problem is, that when you devote serious thought to the subject, you realise that religion matters………….a lot, and the what happens when you raise this subject is you get beaten down by those who explicitly don’t want to be an issue since it undermines their project in its entirety. BTW, I don’t want anyone to interpret this comment as some form of anti-Semitic screed. There’s no hate here.